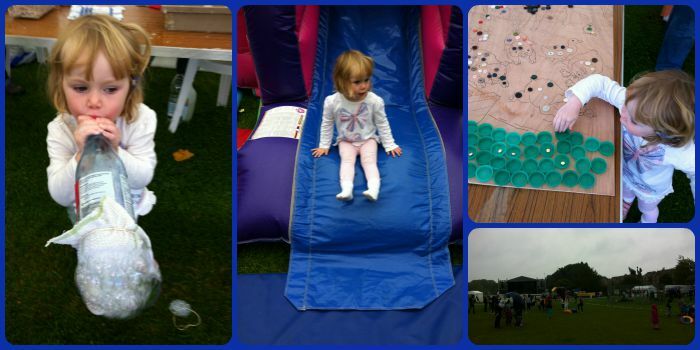 We had a great time at Live in the Park yesterday and today it was the turn of Fun in the Park! This was organised by Aylesbury Church Network and held in Vale Park, Aylesbury. 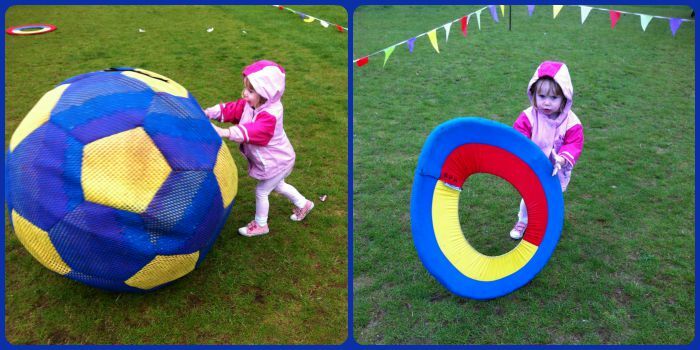 Another free afternoon of activities including inflatables, games, crafts and even the BBQ food was free! As soon as we arrived Little Miss A was taking her shoes off to go on one of the bouncy castles! We then made our way around to one of the other's that had a slide on it before heading into the Messy Church tent to do some crafts. Little Miss A helped do some sticking on a collage and then made a bubble bottle which had pretty impressive results! Little Miss A then finished the set of 3 bouncy castles. We started to queue for the big inflatable slide but they were starting to close the inflatables due to the rain, so we joined the BBQ queue instead to have a hot dog. After our quick stop to eat, Little Miss A still wanted to play and found some oversized toys to play with before we set off home. Today was a slightly different to our experience at Parklife last year when we it was a lovely sunny day. Instead it was threatening to rain when we arrived and then it finally did start raining heavily. Luckily Little Miss A had been on all of the bouncy castles by the time they had to be closed because they were getting too slippy in the rain. She didn't get the chance to go on the big inflatable slide today but luckily seemed to understand that it was closed. Thank goodness she did it yesterday! There was a Proms in the Park organised by Aylesbury Town Council taking place in the evening. I'd love to take Little Miss A to something like this with classical music and fireworks, but will wait until she's a bit older and can stay up later.